Is your home looking a bit tired and dull? It could be that your siding is making it look older than it really is. Giving your home an exterior makeover is easy when you choose to change the siding. If you are ready to upgrade the exterior of your home, be sure to contact the siding contractor Woodbridge VA residents trust: MidAtlantic Contracting. You can call us at 703-492-4663. Old siding can add decades to the appearance of your home. Weather and nature take its toll through the years, leaving behind a dull sheen and even streaks of algae. If your home’s siding is stained and dull, it’s time to take down the old and bring on the new. Replacing your home’s siding with a brand new style will make it look close to new and improve your property values at the same time. We have transformed houses throughout Prince William County and surrounding areas. Is your home next on our list? Why Do You Need Siding Replacement? There are many reasons why replacing your siding is a good idea. Here are five of the top reasons why you should call the siding contractor Woodbridge VA residents count on for their exterior makeovers. Increase your home’s curb appeal – When you drive up to your home in Northern Virginia, do you have pride or just want to disappear inside as quick as possible? When you upgrade the siding on your home’s exterior, your home will become the jewel of the neighborhood. You will take pride in owning the smartest home on the block. No more running into the house with your head down in shame. Increase your home’s energy efficiency – Removing the old siding offers you the opportunity to increase your home’s energy efficiency. Most modern siding materials contain insulation which helps increase the efficiency of your home’s exterior barrier. It also offers you the chance to add an updated vapor barrier and even add more insulation to your exterior walls. This can lower your energy bills and keep your home more comfortable year round. Increase your home’s resale value – When you call on the siding contractor Woodbridge VA homeowners trust, you are taking the first step in increasing your home’s resale value. A home buyer will see the new siding and love the updated look it presents. It is one way to reassure potential buyers that the home has been well cared for. That means your resale value goes up. Repair hidden damage – When doing a siding replacement, you have a one-time opportunity to assess and repair any damage to the exterior structure of your home. You can see any water or insect damage that has occurred. Before you start putting new siding on, you can make repairs. This will ensure your home’s integral structure remains strong while also increasing your home’s value. 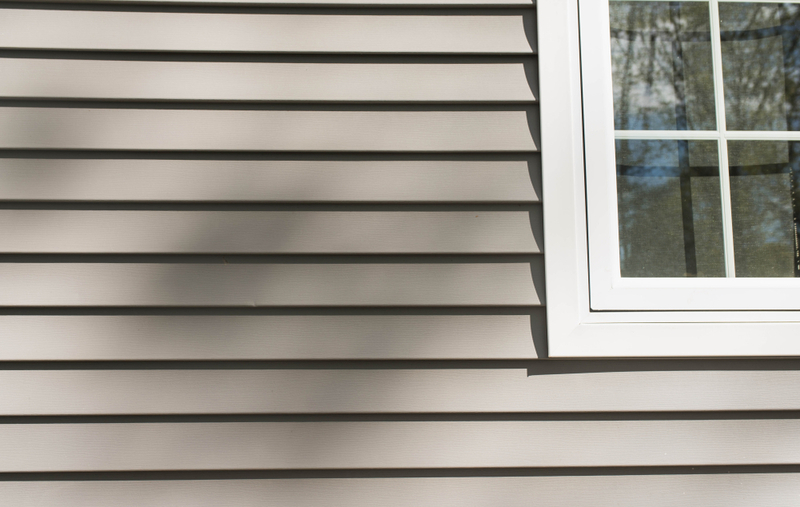 Reduce the maintenance required on your home’s exterior – Siding protects your home from the elements. Your old siding may be loose or damaged, which lowers its ability to protect your house from water infiltration and wind damage. Brand new siding installed by the siding contractor Woodbridge VA homeowners know and trust will keep your home safe for many years to come. Most modern siding products only require an occasional wash to remain good looking for many years. What Makes MidAtlantic Contracting Your Siding Contractor of Choice? When selecting a contractor for your Prince William County project, there are a few things to consider. Is the contractor local? Many contractors claim to be local but come from other places to do work. Working with a local contractor like MidAtlantic means you are working with someone who values their neighbors and their reputation in the community. Is the contractor licensed in the state of Virginia? Contractors can come in from neighboring states to do work without the proper state licensing. This lack of licensing puts you in a dangerous position of not having your project meet local regulations. MidAtlantic Contracting is a fully licensed contractor proudly served our neighbors in Northern Virginia including those in Dale City, Quantico, and Manassas. Does the contractor have local references? An experienced contract will be happy to provide a list of references to any customer who asks. Take the time to check those references to make sure the contractor’s work is of the highest quality. When you get an estimate from MidAtlantic Contracting, we are happy to provide you with a list of recent references and we have no issues with you checking them out. Does the contractor carry a number of siding products or specialize in a few? When it comes to selecting siding for your home, you should know what options are available. That way you can find the siding that best works for your property and gives you the look you desire. MidAtlantic Contracting is proud to offer products from a number of manufacturers. What kind of guarantee does the contractor offer on the work done? The contractor should offer a written warranty of workmanship as well as provide the documentation on the manufacturer’s warranty on the product. MidAtlantic includes all of this documentation with each estimate we provide. Charter Oak® is Alside’s flagship siding product, combining authentic wood beauty with unmatched durability, performance and maintenance freedom. Alside’s exclusive TriBeam® Design gives Charter Oak superior rigidity, while a double-thick nail hem enables it to withstand high winds. Charter Oak has been independently tested to resist Category 5 hurricane-force winds. Odyssey® Plus siding is everything you’d expect from a premium siding product, without the premium price. Extra panel thickness and an advanced lock design provide superior rigidity and holding power. And if you like choices, Odyssey Plus has you covered. With 4 profile options, available in 14 beautiful, timeless colors, and a full range of color-matching trim and accessories, it’s no wonder that it earned the name Odyssey Plus. Performance-engineered for superb durability, Coventry by Alside® incorporates essential design features to deliver outstanding protection for your home. Each panel is infused with rigidity and structural integrity to ensure crisp, smooth wall lines and a beautifully uniform appearance. An occasional rinse with a garden hose will keep Coventry’s natural cedar grain texture and low-gloss finish beautiful year after year. And, Coventry won’t chip, flake or blister — we guarantee it! What makes MidAtlantic Contracting the siding contractor Woodbridge VA homeowners choose? We have been in the business since 1979 with a long proven record of high-quality work and the best customer service. We are a family-owned business who takes pride in serving their neighbors throughout Northern Virginia. We are fully licensed, insured, and bonded to protect you throughout the project. We offer other exterior contractor services such as roofing, gutters, decks, screen porches, and more. If you are ready to get your siding replacement underway, contact the siding contractor Woodbridge VA property owners know they can trust. Call MidAtlantic Contracting today at 703-492-4663. We are happy to offer you a free quote with no obligation.